Goldman Sachs higher ranks continue to replenish the new administration of the US president. Against the background of this the company shares showed strong growth, Dow Jones was rising for several consecutive days. The Goldman Sachs today is thinking about auto- workflows and that makes employees fear for their jobs. However, management is appeasing the staff and soothes at the moment with very careful investment policy, avoiding countries that are in the sight of President Trump. Earnings per share of the company is 16.36, and before today's opening of trading stocks technical summary appears optimistic. Also on the schedule optimism of stock market investors is confirmed. Price again rushed to new heights. Almost near the last frontier the share price stopped, and tells us about the desire of traders to buy the stock again and again, at a higher price. Stocks are again in a situation where they may be referred to the new absolute maximum value. Just want to note that the volatility of the equity instruments have previously delight us with their capabilities. 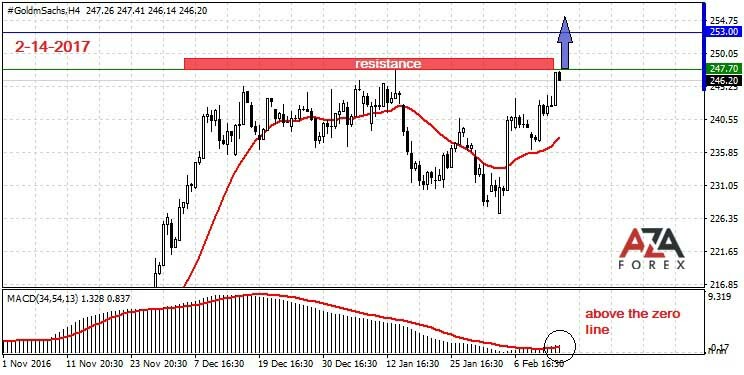 These earnings are not peculiar to the forex market, so we prefer speculations with highly liquid trading instruments, such as shares of the top US companies. Therefore, we will closely observe the behavior of the prices at the opening of the stock market, and if the bulls are strong, we will join them.